Memento from the Kay Cain Papers. 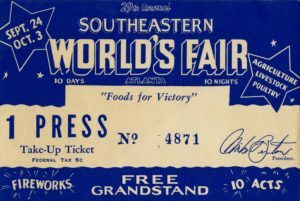 Photos depicting the Southeastern Fair, held annually at Lakewood Fairgrounds, are in the Library’s Lane Brothers and AJC collections. 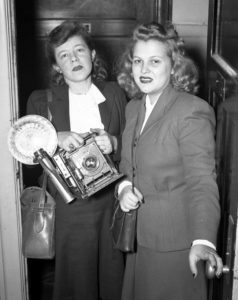 During 1942-44, when the U.S. was fighting in the Second World War, photographer Kay Cain shot feature and news photography for the Atlanta Constitution. This Women’s History Month, Ms. Cain’s story and her photographs and papers in Special Collections and Archives give us a glimpse of how life for women changed in the U.S. during that era. Long after she left Atlanta, Kay Cain gave a collection of photos, papers, and clippings to her physician in San Jose, California. Records in the Ancestry Library Edition database show that Katherine Tolson Cain was born in Missouri in 1910 and died in 1996. Now retired, the doctor contacted Georgia State University Library because he generously wanted the work of his patient and friend to be preserved with the Atlanta Journal-Constitution Photo Archive. 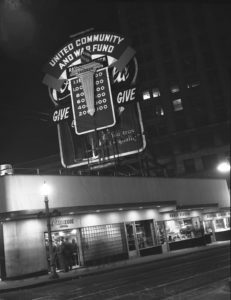 World War Two Atlanta: the sign for the United Community War Fund covers the famous Coca-Cola sign. (Today the site is Margaret Mitchell Square, just north of the Law School and Aderhold). Photo by Kay Cain, published in Life Magazine (online access through the Library). As a staff photographer, Kay Cain was often assigned to so-called “women’s topics,” such as fashion, children, charity events, and celebrities. Her photos show how the war touched Atlantans’ lives, depicting families of men serving overseas, veterans who had returned, and conservation efforts like rationing and paper drives. The Library provides access to the online archive of the Constitution and you can search her name to see more photos by her. 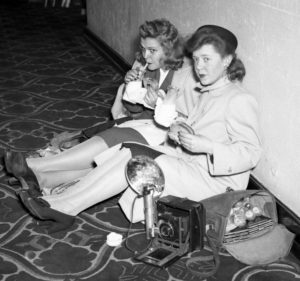 Kay Cain (right) and Jane Noland (left), pretending to wait outside a movie star’s hotel room for an interview, probably in 1943. Constitution colleague H. J. Slayton took the photo; another shot is below. Sometimes she worked with reporter Jane Noland. The collection contains Noland’s manuscripts for a humorous column she proposed, about the two women “forced into the newspaper business by the [wartime] manpower shortage.” In fact, Noland was a talented reporter who later worked for United Press International and Cain had reported for her hometown newspaper in Missouri. So perhaps Noland was being ironic, or perhaps she knew her audience’s assumptions, when she wrote that they were “forced” into journalism. The photo of the pair was staged for this column. (Note the large bag Cain had to carry on assignments, stuffed with film holders and flashbulbs. The camera needed to be reloaded after two shots and each bulb only worked once). Famed photographer Margaret Bourke-White (seated) inscribing a portrait for Bessie Callaway, another pioneering photojournalist at the Constitution. 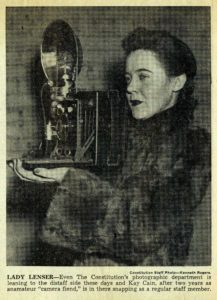 Bourke-White visited in March 1944 and lectured about her experiences as the first American woman to serve as a war correspondent. Photo by Kay Cain. 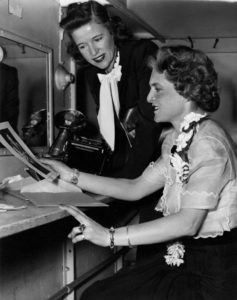 The collection contains other hints about how the war changed the lives of women in the news industry. American women such as Margaret Bourke-White and Dorothea Lange had excelled in photojournalism and documentary photography before the war. But, just as “Rosie the Riveter” famously entered wartime industrial work, so the roles for women already in the workforce changed. The clipping above shows that Cain’s staff position seemed newsworthy, and other clippings show that she was assigned to topics that men would have been a few years earlier, including political events and disasters. (The Constitution’s first woman photographer, hired in 1940, was Carolyn McKenzie Carter; you can see some of her work in the Library’s Digital Collections.) The whole feature about women in the workplace is in the online Constitution archive, and you search the archive for more contemporary coverage of Atlanta women. Kay Cain’s last photo appeared in the Constitution in April 1944. She does not appear in the 1945 Atlanta city directory and may have moved away by then. According to her doctor’s recollection, Kay Cain later worked as a Montessori school teacher and numerologist in California. Unfortunately, we can’t tell from the collection or his memories whether she continued her photography work. The Kay Cain photos complement both the AJC photo archive and the Library’s Lane Brothers Collection of Atlanta photos. Like those collections, they provide a look at life in Atlanta during the Second World War (here are more examples from the Lane Brothers), and a view of how society-wide changes due to the war effort affected gender roles. This entry was posted in Digital Collections, History, Journalism, Primary Resources, Special Collections & Archives, Subject Areas, Uncategorized. Bookmark the permalink. I enjoyed reading this–thoughtfully researched and well written.